Artists get lost in the shuffle of time. It’s not unusual. Time loses all sorts of things, or rather, we humans lose track of things as time goes by. Reputations go up and down. Attributions change: “Caravaggio” becomes “Follower of Caravaggio” (note the anonymity of the designation), and sometimes the other way around. Whole schools and styles and time periods go in and out of fashion: Rococo, anyone? Even in local and regional scenes, people get lost, especially after they’ve died: Out of sight, out of mind. In a way Bonnie Bronson, the Oregon City sculptor and painter who died in a mountaineering accident in 1990, was lucky: the annual art awards that sprang up in her honor have kept her name, if not her art, on people’s minds for the past 20 years. Still, most people who know about the Bonnie Bronson Fund don’t actually know much about Bronson the artist. Thankfully, that’s changing this fall as a series of exhibits across Portland considers Bronson’s legacy in two ways: through the art produced by the 20 (so far) Bronson fellows, and through a long-overdue reassessment of Bronson’s own art. In Sunday’s Oregonian I took a look at two good exhibitions in town right now: curator Randal Davis’s gathering of Bronson’s art at Pacific Northwest College of Art, and curator Linda Tesner’s gorgeously installed exhibit of work by all 20 Bronson award winners. By all accounts Bronson was a pretty amazing woman, adventurous and nurturing and free-spirited. It’s good to rediscover that she was a pretty fine artist, too. 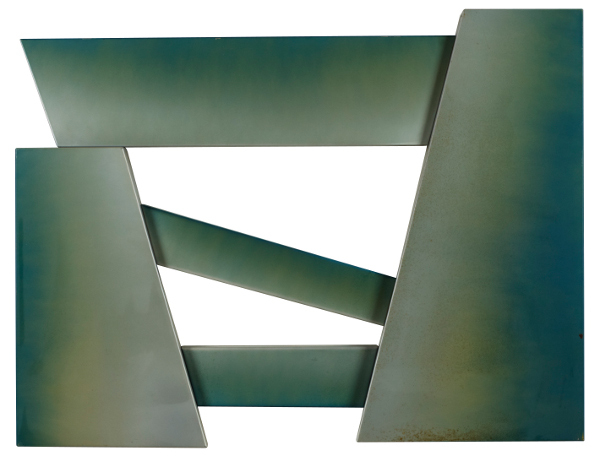 “Landscape through Window” (1986), lacquer on steel, 48 x 36 or 36 x 48 inches (installation variable). Estate of Bonnie Bronson/Photograph: Ben Bright Photography. 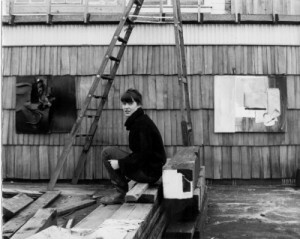 Bonnie Bronson in her studio (1965). Photograph: Estate of Bonnie Bronson.